I was eating lunch the other day with a colleague and the conversation turned to guns. Like most Brits, he considered Texans' paranoid clinging to their guns and the 2nd Amendment both outdated and just plain stupid - although he was too kind to use the latter word. Of course a wide ranging conversation quickly ensured covering all the usual arguments at least once. But the most interesting and revealing comment came following a comparison of the gun death numbers in both countries. Honest Liberal: Gun deaths in the UK are only 35 compared to 35,000 in the US. 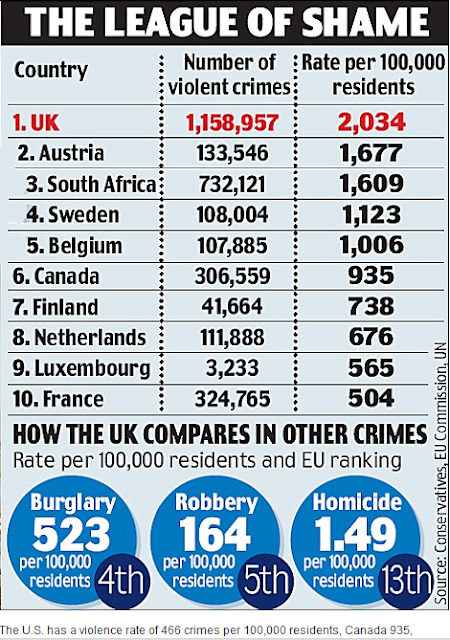 I thought this data from a British source showing a violent crime rate over 4x the rate in the United States (466 compared to 2034) would surely be convincing. While that was not the case, his response did turn out to be highly revealing. Honest Liberal: OK ... I'll give you that ... statistically more people in Britain may say they have been victims of crime ... but they are alive to talk about it. Getting your purse snatched versus being mowed down with a fire arm ... that's the choice. Therein lies the heart of the difference. Liberals would rather have their life than their freedom. They would rather live in a world of petty robbery, home burglary, muggings, government directed health care, government mandated education, government monopoly money, government supervised sanitation, government provided water, government approved food, with confiscatory taxation to implement it all and be alive to talk about it than risk death in the cause of liberty. Of course, liberals want freedom too- freedom to watch the movie of their choice and vacation in the country of their choice, freedom to choose which company will send 3/4 of their pay to the government and which government approved doctor will oversee their health, freedom to vote for which politician will drop the tax on them 10% and raise it 20% on the other guy, freedom to either walk or drive their 1.1 children to the government mandated school, freedom to go to bed at the time of their choosing, freedom from being fired by their employer or injured in their wood shop, and freedom to be robbed and live to talk about it. Nothing illustrates the contrast between liberals and patriots better than to compare this actual conversation about how liberals view life with this actual flag about how patriots view liberty. 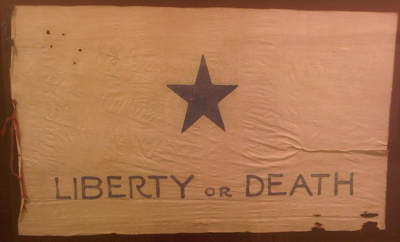 This is the Troutman flag hanging in the Texas State Bar building in Austin, TX. It is blue pigment on a plain white sheet. In 1835 the Texan's fight for independence from the Mexican confederation attracted attention throughout the United States. Although the US rightfully did not entangle itself in this foreign issue, hundreds of individuals properly responded to the call for help. This flag was made by 18 year old Joanna Troutman for one such group from Macon, GA. 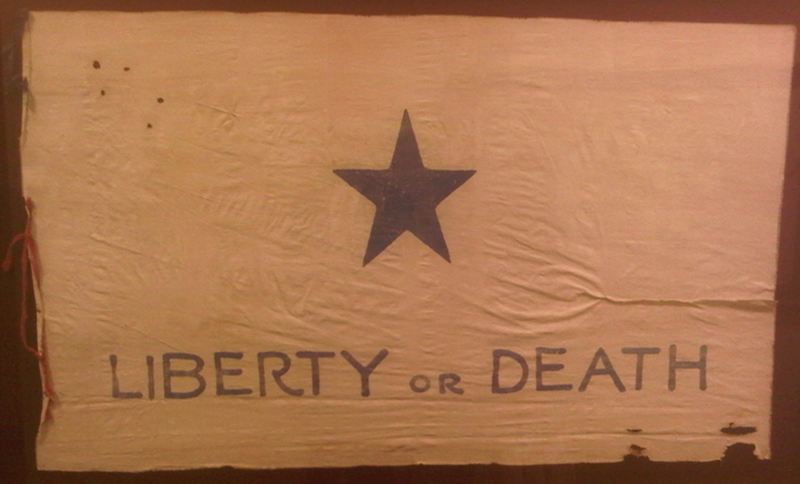 The flag was raised when the Georgians arrived at Velasco and became an inspirational symbol in the dark months leading up to the victory at San Jacinto. Virtually the entire GA command along with the Red Rovers from Alabama and the Texans under Col Fannin were taken prisoner and massacred following losses at Refugio and Colete. Those who are unwilling to risk their life in the cause of liberty usually have neither. Those who are willing to risk their life for the sake of honor and liberty usually have both. But yes, the tree of liberty does need watered with the blood of patriots from time to time.